The annual Roy Griak Invitational was conducted Saturday at the U of M.
Covert breezed to victory by more than 20 seconds and repeated as champion at the prestigious 5,000-meter race. Saturday marked her third Griak title overall and bookended her first-place performance as a seventh-grader in the Maroon race. Covert bested Math & Science Academy sophomore Tierney Wolfgram (17:50.7) and Farmington senior Lauren Peterson (18:04.4). Washburn teammate Grace Dickel placed 10th in a field of 455 runners from the region. Covert, who won the Class 2A cross-country state meet last November, said Saturday’s performance at a high-profile race about six weeks before the state meet bodes well. “Hopefully this sets me up for a fast time at the end of the season,” she said. For Johnson’s part, he mostly sits back and watches his senior fly. Wolfgram, though second to Covert, placed first among Class 1A runners at the Griak meet. As with Covert, additional glory at the state meet becomes Wolfgram’s next focus. She won the past two small-school titles. 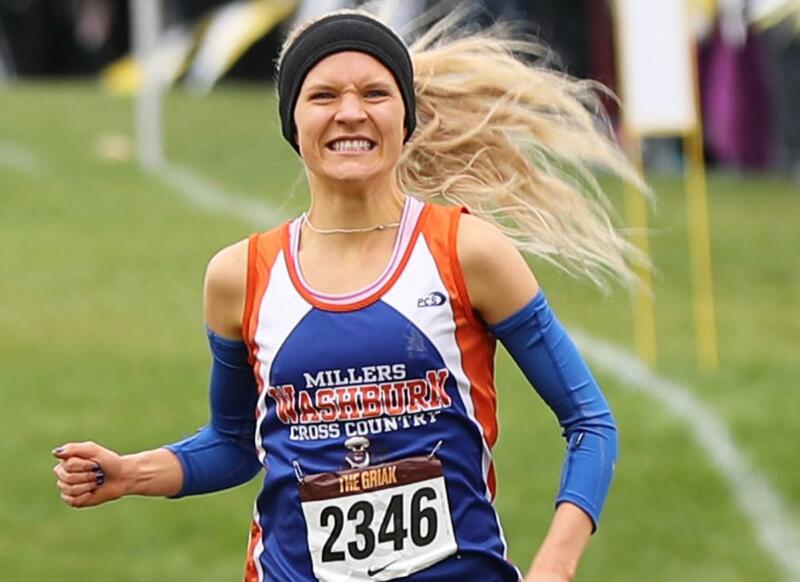 On Saturday, she improved on last year’s 17th-place finish at Griak and stayed ahead of Winona Cotter sisters Lauren and Grace Ping, who placed fourth and sixth. In team competition, Wayzata led Minnesota teams with a fourth-place finish. On the boys’ side, Edina senior Max Manley won the Gold race in a time of 15:45.9. He held off Roseville’s Acer Iverson (15:49.9) and Wayzata’s Andrew Brandt (15:51). With Manley out front and a strong eighth-place finish from senior Willem Gokemeijer, Edina won the team title with 154 points. Manley’s victory owed to a strong track and field state meet. Placing second there in the 3,200- and 1,600-meter races made him a believer. But an additional runner-up finish as the anchor of the 4x400 relay subjected Manley to a little grief. “We were giving him a hard time about it, like, ‘You’ve got a lot of red ribbon hanging around your neck, there,’ ” Kirkpatrick said. Manley hopes his Griak results help him earn that elusive blue ribbon for a state champion. “Track season gave me the confidence I really needed to push myself up front like I’ve been doing,” Manley said. In the Maroon races, St. Louis Park freshman Josie Mosby won in a time of 19:09.2 and led the Orioles to the girls’ team title. On the boys’ side, Staples-Motley sophomore Emmet Anderson took second overall (16:29) and first among Minnesota runners. Mankato East placed second as a team.